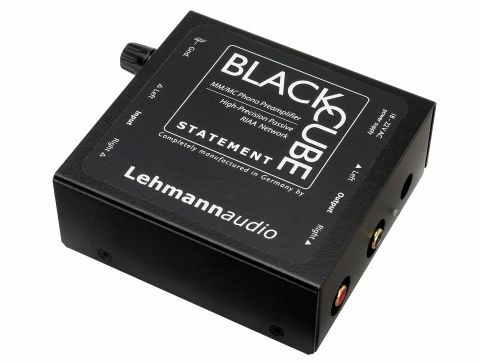 Lehmann is pretty well known for its phono stages, some of them decidedly upmarket. Despite the name, this recent model is an entry-level one. While it may look reminiscent of much cheaper models from NAD and Pro-Ject, it is in fact considerably more sophisticated than either of them. First, it has more complicated circuits using higher quality op-amps, and second, it has several options for tailoring its performance to suit the user's cartridge and following amplifier. The most obvious bit of tailoring is the ability to set gain to low (for moving magnet cartridges) or high (for moving coil types). This is done on miniature switches underneath the amp, where it is also possible to select cartridge loading. The default is the usual 47k, but 1k and 100 ohms are also possible and if that's not enough you can install a resistor or capacitor internally to be selected by the fourth switch. There are also jumpers inside to add an extra 10dB of gain, roll off bass and bypass the output capacitors. We were very taken by this little amp, especially with a moving magnet cartridge as source. Its sound is open and quick, with very good insight and also excellent extension at both frequency extremes, and its lack of hum and low noise level are also welcome.